Engaging, atmospheric and provocative drama about the dangers of collective hysteria, with a strong script and a terrific central performance from Mads Mikkelsen. Directed by Thomas Vinterberg, The Hunt (or Jagten, original title fans) is set in present-day rural Denmark and stars Mads Mikkelsen as Lucas, a much-loved kindergarten teacher who is still recovering from a messy divorce and struggling with his ex-wife over contact with his teenage son Marcus (Lasse Fogelstrom). When young Klara (Annika Wedderkopp), a pupil of Lucas' and the daughter of his best friend Theo (Thomas Bo Larsen) develops a crush on Lucas and kisses him in class, he firmly sets her straight, but she lashes out with a lie that leads the headmistress (Susse Wold) to suspect that he has abused her. In the midst of a panic and attempting to follow what she thinks is the correct procedure, the headmistress asks the other parents to ask their children if anything unusual has happened at school and soon Lucas is at the centre of a witch hunt as the entire community turns against him. Horrified that anyone could think he was capable of doing such a thing, Lucas refuses to defend himself, but he soon realises that the accusation could have devastating consequences for his sought-after access to Marcus. Mikkelsen is terrific as Lucas, delivering an impressively understated performance that deservedly won him Best Actor at Cannes. There's also superb support from both Thomas Bo Larsen and Alexandra Rapaport (as Lucas' new girlfriend, a Turkish immigrant), while young Annika Wedderkopp is both believable and affecting as Klara. Vinterberg's assured direction cranks up the tension to the point where the audience is practically yelling at the screen for Lucas to actually fight his corner. The film is also superbly shot, with Charlotte Bruus Christensen's cinematography creating a strong sense of place within the small town community. It's fair to say that the message of the film is open to misinterpretation, especially since the film centres on a group of children lying about child abuse. However, it's clear from the fact that there's no ambiguity about Lucas' innocence that Vinterberg is more interested in exploring ideas of collective hysteria and, as the chilling final scene makes clear, the long-lasting damage it can do to a community. 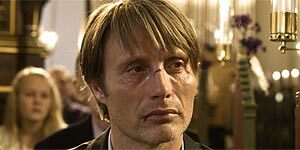 The Hunt is an emotionally engaging, thought-provoking Danish drama that's worth seeing for an award-winning central performance from Mads Mikkelsen. Recommended.